Okay, I’m going to admit to a little gushing here: I adore Gerald Morris. I have been reading his books for what seems like forever. I can’t even count how many times I checked them out from various libraries until I was finally able to buy my own set. The ten books of the Squire’s Tale series can be sorted as MG (Middle Grade) or YA (Young Adult) depending on what bookstore you’re in, but the newer Knights’ Tales series is solidly MG.
Sir Gawain the True is the third of this new series and revisits one of the main characters from the other series. The classic tale of Sir Gawain and the Green Knight is retold here with a charming lesson on manners and the importance of keeping promises- and making them carefully. King Arthur firmly believes in courtesy and gallantry, but his knights- including his nephew Gawain- are a little slow to take this to heart. When Gawain rescues a damsel but doesn’t bother to ask her name or accept her tokens of thanks, he finds someone more than willing to teach him that all-important lesson, and he may even find a very good friend along the way. The tone of these books is amazing, light and fun with a dry wit and pointed commentary that will delight adult readers as well as children. I don’t know what this says about me, but I spent years convinced that Morris was British because of the breed of humor. There’s a lovely balance between the humor and the more serious moments, with a keen sense of the ridiculous in its many forms. Proof?- read the challenges at the castle. I nearly hurt myself laughing, but there really are people like that! Or, for a somewhat sharper observation, read between the parentheses on page 37 (review from an uncorrected advance through NetGalley- finished page numbers may not correspond). There’s something about the idea of knights that’s a little irresistable. Maybe it’s the shiny metal suits, or the way they bash each other off high-speed horses with pointy sticks (anyone else have Wat from A Knight’s Tale stuck in their head now? ), or the chivalry, or the damsels in distress. I played at knights all the time when I was little. Never the damsel in distress, though. I was the girl disguised as a boy to earn my knighthood and go off on grand quests. It’s not just a child’s fascination though. There’s a reason jousts are so well attended at Renaissance Festivals, and it’s not just because the knights are hot rock stars. We never really grow out of our fascination with knights. Whether you’re a parent, teacher, or librarian, or just think knights are rock stars, this is a fantastic way to introduce young readers to the Arthurian legends. Aaron Renier’s illustrations are beautiful and fun, spaced well throughout the text, and the writing is fast-paced and light. Think The Princess Bride on a younger scale, with a narrator who admits to cutting out the boring parts. If they get hooked on this, then definitely introduce them to the Squire’s Tale series as they get a little older. If this is your first exposure, each of the Knights’ Tales books stand on their own, so you don’t have to read the others first, but you’ll definitely want to read them after. 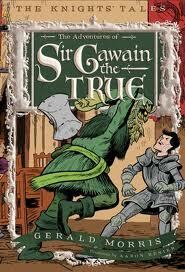 Sir Gawain the True, the third book of the Knights’ Tales series by Gerald Morris, available on 18 April 2011. If you ever cheered for the knights racing down the lists, you want to read these books.